Feeling blue? Squeeze a lemon. Research has shown that the lemon scent has a positive effect on mood, whether or not you expect it to. While not all of us can or want to grow citrus, the good news is that we don't have to if we want to enjoy that lemony boost. Lemon Balm (Melissa officinalis) and Lemon Verbena (Aloysia citriodora) are two of our loveliest scented herbs with uses in and out of the kitchen. Which one you decide to grow depends on how easy you like your life to be, and on the conditions you can provide. They have slightly different perfumes, so you might be tempted to grow both. This is the tender one, with the reputation for being difficult, but its pure, zingy scent means that people persevere even when success seems elusive. It's also, arguably, the more attractive, growing to 9 feet (3m) or more when it's really happy, (more like 3 feet (1m) in a pot) with a delicate network of branches carrying elegantly slim, bright green leaves. It does tend to grow leggy, though, so to prevent this, and to ensure a constant supply of good leaves, it's worth taking the secateurs to it at intervals throughout the summer, to prune back longer stems. Pot-grown specimens should be cut back to around 12 inches (30cms) when taken in for winter. I wouldn't even think of planting lemon verbena outside if you suffer frost, so unless you have a greenhouse, it's best to grow it in a pot that you can move indoors in the colder months. (When you do move it, be prepared for the leaves to drop off – no, you haven't killed it.) The Herb Society of America describes it as "marginally hardy" in Zone 8, so if you do plant it outside in cooler areas, put it somewhere very sheltered and protect it well with fleece or straw come autumn, ensuring the covering remains firmly in place over winter. 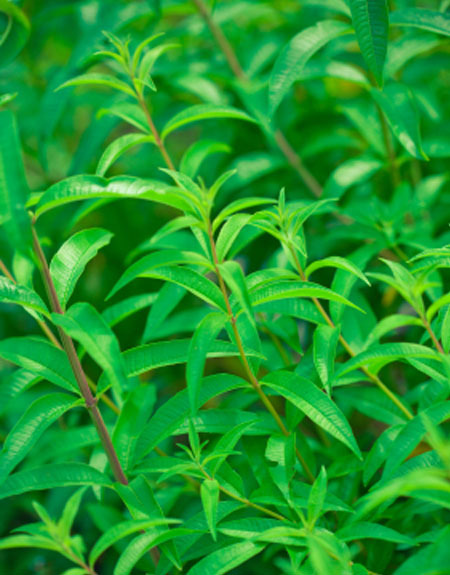 Lemon verbena needs well-drained soil and full sun. In a pot I'd use compost amended with sand to keep an open structure, and feed it every few weeks with an all-purpose organic fertilizer during the summer. If you must plant in clay, the soil needs to be very thoroughly amended with compost and sand, as it hates having wet roots. Once it's wrapped up for the winter, whether outside or in a pot, the soil should be only slightly moist and you should hold off watering until spring unless the soil is extremely dry. It's easiest to buy a plant from the garden centre, but it's a good idea to take cuttings every year, to guard against winter losses. These should be taken in summer, when it's growing strongly, and either softwood or semi-ripe cuttings (with a small heel of stem attached) should be successful. If you end up with too many plants, your friends will love you for giving them as presents. 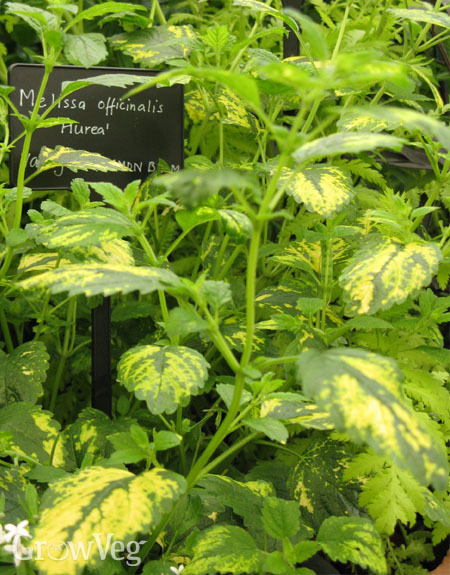 This is the one to choose if you like to pay your herbs little attention or have clay soil and/or shade. It's happy almost anywhere, even in dryish conditions, though it prefers moist, rich soil. Some shade during the day is desirable, especially if your climate is very hot, and you may even find that shade helps it taste stronger. Like Verbena, Lemon balm also has a reputation, this time for being invasive, and it's often bracketed with mint on that score. However, it spreads by seed, not runner, so cut the flower heads off before they seed to reduce your weeding. Balm comes in cultivars other than plain green. All Gold has greeny-yellow leaves, and Aurea is variegated. These have a greater need for shade (they tend to scorch or green up when overheated) which makes them a useful choice for brightening up a slightly gloomy corner. They also are less vigorous self-seeders. Again, a single plant is likely to be enough, so it's easiest to buy one, harden it off, and plant in the garden. The young leaves in spring (the plant dies back in winter) definitely have the best flavour and, after flowering, the leaves tend to be small and faded. Prolong your harvest by cutting back after flowering to produce fresh growth. Herb teas have to be my favourite way of enjoying these herbs. I seem to buck general opinion, as I actually prefer the more layered taste of lemon balm. A few leaves brewed in a cup for five minutes brings sunshine to your palate (brew with the cup covered to preserve the taste-laden essential oils that otherwise evaporate). However, you can also mix handfuls of leaves into a jar of sugar to obtain a lemon-flavoured ingredient for cakes and puddings. Add leaves to salads, fruit salads and herb butters. If cooking, add balm at the last moment as it loses its flavour far more easily than verbena. Lemon verbena also tends to keep its scent much better than balm when dried, so is preferable if you want to make pot pourri. "I love lemon balm and in an attempt to find more ways to use the easy growing plant I discovered that lemon balm is also a great exchange for basil in pesto. It makes the most fabulous lemony pesto that works great in dishes, especially over fish. When we can appreciate the culinary versatility that plants offer us it helps us to appreciate our gardens more." "Lemon Verbena is my favorite herb! Great in a lemony salad dressing." "Lemon verbena is great to mix with nettles...completely lifts the flavour and provides brilliant nutrients :-)"